Joseph Farquharson (1846-1935). Farquharson was born in Edinburgh, Scotland. He combined a long and prolific career as a painter with his inherited role as a Scottish laird. He painted in both oils and water colours. His mother, a celebrated beauty, was an Ainslie. His early days were spent in his father's house in Northumberland Street below Queen Street Gardens and later at Eaton Terrace beyond the Dean Bridge, Edinburgh and at Finzean. His father, Francis, was a doctor and laird of Finzean in Aberdeenshire. Joseph was educated in Edinburgh and permitted by his father to paint only on Saturdays using his father’s paint box. 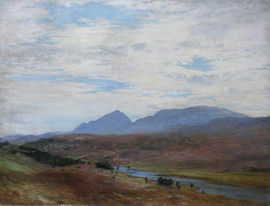 When Joseph reached the age of 12, Francis Farquharson bought his son his first paints he could call his own and only a year later he exhibited his first painting at the Royal Scottish Academy. His first major portrait was of ' Miss Alice Farquhar ' exhibited 1884. His first exhibit at the Royal Academy, 'Day's Dying Glow ', was in 1873. Much like other leading Aberdeen artists John Philip and William Dyce, Edinburgh and Glasgow were bypassed in favor of London in order to win a wider audience and patrons.